Widow's Kiss - a black flower resembling a harebell but with black/grey leaves. Only grows near barrows or graves. Troll Root - a gnarly, twisted bush with thick black branches found in the more wild environments like Sundered Hills or in otherwise remote locations. 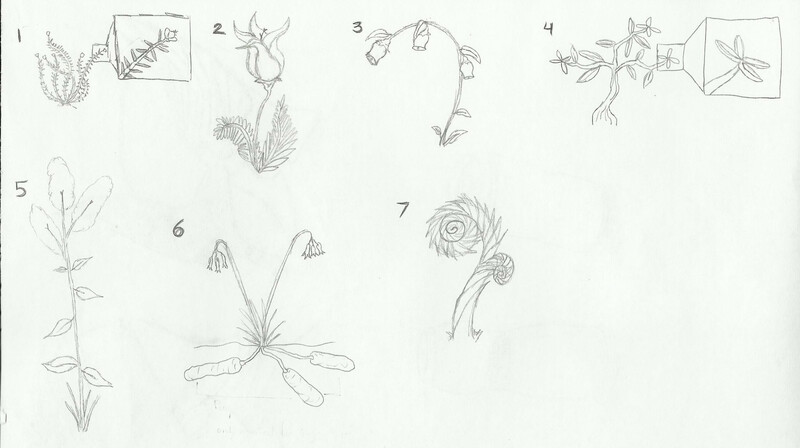 I found some old concept sketches by SamirA for Skyrim plants. Most of them have a spikey look that I would like to see in The Reach. Two of them already exist in our gameworld: The Honey Lily and the Vicar Herb. I would like to rework the Taragetis and the Dragynia, because they don't work really well at the moment, mostly for their color schemes. At the very least they will require some color adaption. But maybe they will turn into one of the plants on this drawing. Some of our container plants are much too frequent by now. So Roerich and me thought about creating additional diversification. Maybe the wither wheat could be a wild growing plant in the grassy areas, for example. I'm not sure on the cloudy corn, right now. Perhaps replace it with the cotton-like plant from the above drawing? Now that is a blst from the past right there. I had no idea any of these had been made. Awesome! After looking at container plant counts across The Reach, one in the forest, one in the western Grassland, one in the southern Grassland and one in the Wastelands, I can say that the lack of variety is a problem of excessive container plant placing in the first place, rather than an insufficient range of species. For all areas except the wastelands the amount of container plants per cell were between 60 and 77. The Wasteland cell had 29 container plants. In comparison an Ascadian Isle cell without water and farms (5 samples taken) has mainly between 12 and 18 container plants. A solstheim cell in Average has between 8 and 13 container plants (only holliberries). However, a grazeland cell, in average, has between 80 and 140 container plants, entirely wickwheat (it is the only plant growing there besides trees). Also, the count goes very high wherever marshmarrow and salt rice are involved. Though, these three crops seem to be special exceptions to a mainly much thinner distribution of container plants. Regarding TR, A green map 5 cell around baan malur with little rock ground seems to have 25-30 container plants in average. I have looked once more through our range of container plants in The Reach and I think we actually have a decent variety (far more than vanilla, at least). It only seems that there are very many containers in each cell making the sight of a particular plant an often-repeating occurence across the Region. Perhaps we'd rather reduce the amount of container plants per cell by half and maybe reconsider what plants should grow where in the first place. For one we could look about keeping our mushrooms mostly to the forest region and otherwise in shady, forested spots rather than having rust russulas in each corner (shelf fungi would probably be a nice addition). At the same time sun-loving plants like the Wrothgarian Grape could be mainly kept to the grassy areas. I agree with all those points. Having more thought about where to place container flora, but I'd also like to see some region-specific flora and some very rare flora. The excessive placement of container plants and other statics that may look repetitive is mostly due to the landscape being quite boring if you disable grass, a common problem I've had around the Northern Gold Coast as well. We'll have to stick to vanilla's way of solving this problem in the future: add more rocks and less groundcover. A new plant container for the falkar foothills, waiting for a fitting name. Looking great!! These will be useful. What about 'Skybell' named after the colour? Windbride bells. or windbells? bridebells sound good as well. For me it is either 'Windbride Bells' or 'Bleakbell Hay'. Both sound equally good to me.